Welcome back to another edition of the Monday Menu! This week I have a special guest, Andrea from Good Girl Gone Redneck! I love having guests here and it’s even more fun when they share a great recipe. So give her a warm welcome and enjoy the recipe! Thanks to Jackie for inviting me over to her magical place today so I can share a yummy recipe with you all! I’m not exactly sure where I found some variation of this recipe. I think I was leafing through a crockpot cookbook, and when I saw something about hot fruit salad I figured I would give it a try. It’s a perfect treat during the cooler weather, and really warms you from the inside out. Plus it’s so simple even a lazy mom like me can make it while doing 900 other things around the house! Combine in crockpot. Mix ingredients. This is a yummy breakfast treat, or a great snack, dessert, it can be served pretty much any time of day. Obviously it’s only really yum if you enjoy warm “fruit,” which I do, so it works for me. 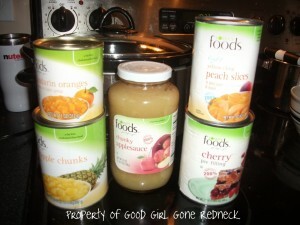 You can also try it with apple pie filling, or make your own to toss in if you’re adventurous and brave enough to do so. When you do that it reminds me of the breakfast apple toppings at Cracker Barrel or IHOP, which I could honestly live off of. You can serve it with biscuits (Pillsbury is my friend), or tarts. Yum. You could also probably easily make a crepe or crepe/pancake/waffle topping out of it. Double yum. With cheesecake, even, if you do fruit with yours (I don’t, but I’m suggesting it anyway). Or just serve it solo, because warmed up it’s absolutely delicious … all by itself. 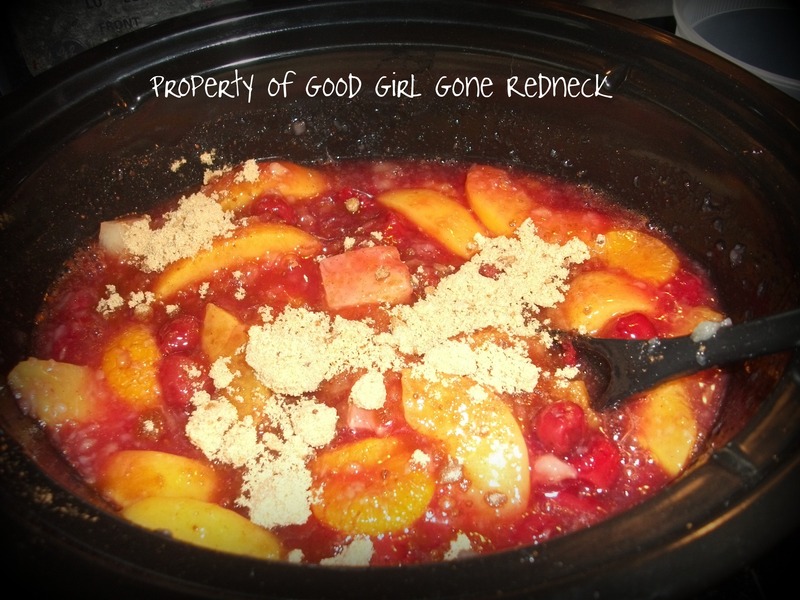 Andrea blogs regularly over at Good Girl Gone Redneck where she takes pride in sharing any and all Lazy Mom Recipes she comes up with or stumbles across!